The Repair Station is a structure which repairs damage to any vehicle's hull and armor that drives onto it at a rate of 33% (hull/armor) per second. 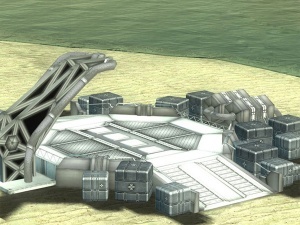 In addition, the Repair Station allows you to change the vehicle's weapon, armor and engine loadout. Simply drive on a Repair Station and press the vehicle customization button (default v). Select your chassis from the drop down menu and make any changes necessary and press the build button. Credits will be deducted or deposited to the total depending on the cost of your changes and your altered vehicle will be created. After the changes your vehicle will have no armor plates, but these will be repaired if you remain at the station. If the hull of a vehicle is damaged, the Repair Station will first repair the hull and then move on to the armor. You can only customize a loadout within the same chassis of the vehicle you drive onto the Repair Station. The Command Vehicle will not be repaired by the Repair Station. Vehicles have to remain out of combat for 10 seconds until the repair station will begin its repairs. Placing mines on an enemy Repair station is a good way to destroy weakened tanks. Weapons that cannot harm vehicles are not able to harm this building. This page was last modified on 5 September 2013, at 00:28.